Time for my June Bookanistas Review! OUT OF REACH by Carrie Arcos. Carrie is a fellow Apocalypsie and a Simon Pulse sister, only adding to my love of this National Book Award Finalist. How do you find someone who doesn’t want to be found? A girl searches for her missing addict brother while confronting her own secrets in this darkly lyrical novel. Rachel has always idolized her older brother Micah. He struggles with addiction, but she tells herself that he’s in control. And she almost believes it. Until the night that Micah doesn’t come home. Rachel’s terrified—and she can’t help but feel responsible. She should have listened when Micah tried to confide in her. And she only feels more guilt when she receives an anonymous note telling her that Micah is nearby and in danger. With nothing more to go on than hope and a slim lead, Rachel and Micah’s best friend, Tyler, begin the search. Along the way, Rachel will be forced to confront her own dark secrets, her growing attraction to Tyler…and the possibility that Micah may never come home. OUT OF REACH is a story about substance abuse and it’s effect on a family, particularly a brother and a sister, but I believe it’s message is much broader. It reminds us that no matter how much we want to, we can’t change other people. We can only change ourselves. One of the things I found fascinating about Carrie Arco’s writing was how quiet the revelations were in a book with such strong topics. There were some very serious moments, but they were brilliantly contrasted by the slow dawn of personal revelations and the sweet weaving of new relationships. Love against loss.And hope–always hope. 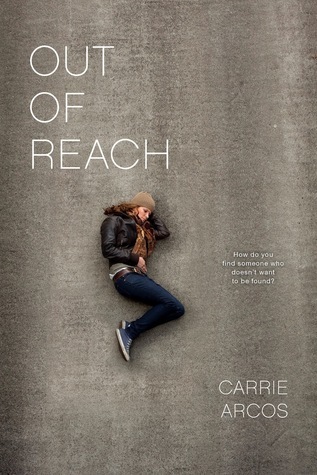 Carrie Arcos is a National Book Award Finalist for Young People’s Literature for OUT OF REACH, her debut YA novel. Have you read any of the books reviewed by the Bookanistas this week? Any thoughts? Have you read any other books that have handled the topic of substance abuse and addiction really well?